Of great help in this is an experienced guide who sees a human soul. But such guides were very rare even in ancient times, as the Fathers testify. It is even more difficult to find such guides in our times. The Holy Fathers foresaw that in the latter times there would be a famine of the word of God (even though the Gospels are now printed abundantly!) and instructed sincere seekers in advance to conduct their spiritual lives by means of “living under the guidance of patristic writings, with the counsel of their contemporary brothers who are successfully progressing [in spiritual life]”. These words belong to one of the most authoritative Russian spiritual instructors and writers of the nineteenth century, Saint Ignatius Brianchaninov (1807–1867). His writings are a kind of Orthodox ascetical encyclopedia representing one of those very patristic writings, yet being of a particular value for a modern-day Christian. This value comes from the fact that his writings are based upon his scrupulous study of patristic writings, tried in the furnace of his personal ascetical experience, and provide a clear exposition of all the most important questions of spiritual life, including the dangers that can be met along the way. They set forth the patristic experience of the knowledge of God applicable to the psychology and strength of people living in an epoch closer to us both in time and degree of secularization. Here we shall present only a few of most important precepts of his teaching on the question of correct spiritual life. Therefore, a task of the utmost importance arises: finding the more essential indications and qualities of true spirituality, which would allow one to differentiate it from all the possible forms of false spirituality, mysticism, and prelest. [For a definition of a Russian (slavonic) orthodox spiritual term «prelest» — see below.] This has been sufficiently explained by the Church’s 2,000 years of experience in the person of its saints; but modern man, raised in a materialistic and unspiritual civilization, runs up against no little difficulty in assimilating it. Below are some of those obstacles. Patristic teachings have always corresponded to the level of those to whom they are directed. The Fathers of the Church never wrote “just for the sake of it” or “for science.” Many of their counsels, directed at ascetics of high contemplative life and even to so-called beginners, no longer even remotely correspond to the spiritual strength of the modern Christian. Furthermore, the variety, ambiguity, and at times even contradictoriness of these counsels that naturally occur due to the varying spiritual levels of those who seek them can disorient the inexperienced. It is very difficult to avoid these dangers when studying the Holy Fathers without knowing at least most important principles of spiritual life. On the other hand, a correct spiritual life is unthinkable without patristic guidance. Before this seemingly insurmountable impasse, we can see the full significance of the spiritual inheritance of those fathers, most of whom are closer to us in time, who “restated” this earlier patristic experience of spiritual life in a language more accessible to a modern man little acquainted with this life, who usually has neither a capable guide nor sufficient strength. The works of Saint Ignatius Brianchaninov are among the best of these “restatements,” which provide an impeccably reliable “key” to understanding the teachings of great laborers in the science of sciences — the ascetics. First of all in his writings we find a profound spiritual explication of the most important question in Christianity — Faith in Christ. «The beginning of conversion to Christ consists in coming to know one’s own sinfulness and fallenness. Through this view of himself, a person recognizes his need for a Redeemer, and approaches Christ through humility, faith, and repentance (4:277). He who does not recognize his sinfulness, fallenness, and peril cannot accept Christ or believe in Christ; he cannot be a Christian. Of what need is Christ to the person who himself is wise and virtuous, who is pleased with himself, and considers himself worthy of all earthly and heavenly rewards?» (4:378). Within these words the thought involuntarily draws attention to itself that the awareness of one’s own sinfulness and the repentance proceeding from it are the first conditions for receiving Christ. 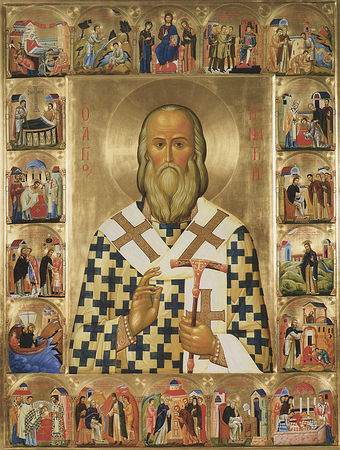 The holy hierarch emphasizes: it is not the belief that Christ came, suffered, and was resurrected that makes the beginning of conversion to Christ, for the devils also believe, and tremble (Jas 2:19), but the knowledge of «one’s sinfulness, one’s fallenness» gives birth to the true faith in Him, for «he who does not recognize his sinfulness… cannot come to believe in Christ». The holy hierarch’s thought shows the first and main position of spiritual life, which so often slips away from the attention of the faithful and shows the true depth of its Orthodox understanding. The Christian, as it happens, is not at all the one who believes according to the tradition or who is convinced of the existence of God through some form of evidence, and, of course, the Christian is not at all one who goes to Church and feels that he is “higher than all sinners, atheists, and non-Christians.” No, the Christian is the one who sees his own spiritual and moral impurity, his own sinfulness, sees that he is perishing, suffers over this, and therefore he is inwardly capable of receiving the Savior, thus acquiring the true faith in Christ. This is why, for example, Saint Justin the Philosopher wrote: “…He is the Logos in Whom the whole human race partakes. Those who live according to the Logos are Christians in essence, although they consider themselves to be godless: such were Socrates and Heraclites, and others among the Hellenes … . In the same way those who lived before us in opposition to the Logos were dishonorable, antagonistic to Christ … while those who lived and still live according to Him are Christians in essence.” This is why so many pagan peoples so readily accepted Christianity. On the contrary, whoever sees himself as righteous and wise, who sees his own good deeds, cannot be a Christian and is not one, no matter where he stands in the administrative and hierarchical structure of the Church. Saint Ignatius cites the eloquent fact from the Savior’s earthly life that He was received with tearful repentance by simple Jews who admitted their sins, but was hatefully rejected and condemned to a terrible death by the “intelligent,” “virtuous,” and respectable Jewish elite — the high priests, Pharisees (zealous fulfillers of Church customs, rules, etc. ), and scribes (theologians). Those who are well have no need of a physician, but those who are sick (Mt 9:12 [NKJV]), says the Lord. Only those who see the sickness of their soul and know that it cannot be cured through their own efforts come to the path of healing and salvation, because they are able to turn to the true Doctor Who suffered for them — Christ. Outside of this state, which is called “knowing oneself” by the Fathers, normal spiritual life is impossible. “The entire edifice of salvation is built upon the knowledge and awareness of our infirmity,” writes Saint Ignatius (1:532). He repeatedly cites the remarkable words of Saint Peter of Damascus: “The beginning of the soul’s enlightenment and mark of its health is when the mind begins to see its own sins, numbering as the sands of the sea” (2:410). «Humility and the repentance which comes from it are the only conditions under which Christ is received! Humility and repentance are the only price by which the knowledge of Christ is purchased! Humility and repentance make up the only moral condition from which one can approach Christ, to be taken in by Him! Humility and repentance are the only sacrifice which requites, and which God accepts from fallen man (cf. Ps 50:18–19). The Lord rejects those who are infected with pride, with a mistaken opinion of themselves, who consider repentance to be superfluous for them, who exclude themselves from the list of sinners. They cannot be Christians» (4:182–183). «I do not see my sin because I still labor for sin. Whoever delights in sin and allows himself to taste of it, even if only in his thoughts and sympathy of heart, cannot see his own sin. He can only see his own sin who renounces all friendship with sin; who has gone out to the gates of his house to guard them with bared sword — the word of God; who with this sword deflects and cuts off sin, in whatever form it might approach. God will grant a great gift to those who perform this great task of establishing enmity with sin; who violently tear mind, heart, and body away from it. This gift is the vision of one’s own sins» (2:122). Saint Ignatius devotes great attention to this question. He sees it in two aspects: first, in the sense of understanding the necessity of Christ’s sacrifice; and second, with respect to Christian perfection. His conclusions, proceeding as they do from patristic experience, are not conventional for scholastic theology. «The doer of human righteousness is filled with self-opinion, high-mindedness, and self-deception … he repays with hatred and revenge anyone who dares to open his mouth to pronounce the most well-founded and good-intentioned contradiction of his righteousness. He considers himself worthy, most worthy of both earthly and heavenly rewards» (4:47). «Do not seek Christian perfection in human virtues. It is not there; it is mystically preserved in the Cross of Christ» (4:477–478). In other words, virtues and podvigs can also be extremely harmful if they are not founded upon the knowledge of hidden sin in the soul and do not lead to an even deeper awareness of it. Saint Ignatius instructs: “One must first see his sin, then cleanse himself of it with repentance and attain a pure heart, without which it is impossible to perform a single good deed in all purity” (4:490). “The ascetic”, he writes, “has only just begun to do them [good deeds] before he sees that he does them altogether insufficiently, impurely. … His increased activity according to the Gospels shows him ever more clearly the inadequacy of his virtues, the multitude of his diversions and motives, the unfortunate state of his fallen nature. … He recognizes his fulfillment of the commandments as only a distortion and defilement of them” (1:308–309). Therefore, the saints, he continues, “cleansed their virtues with floods of tears, as if they were sins”… . (2:403). These are remarkable words! To someone who is spiritually inexperienced the very thought that a virtue can be untimely, never mind deadly to the soul, “like a viper,” would seem strange and almost blasphemous. But such is the very reality of spiritual life; such is one of its strictest laws, which was revealed by the vast experience of the saints. In the fifth volume of his Works, which Saint Ignatius called An Offering to Contemporary Monasticism, in the tenth chapter, entitled “On caution in the reading of books on monastic life”, he states openly: “The fallen angel strives to deceive monks and draw them to destruction, offering them not only sin in its various forms, but also lofty virtues that are not natural to them” (5:54). One should begin at the beginning; that is, pray with attention and reverence, with the purpose of repentance, taking care only that these three qualities be continually present with the prayer.… In particular, most scrupulous care should be taken to establish morals in accordance with the teachings of the Gospels. … Only upon morality brought into good accord with the Gospel commandments … can the immaterial temple of God-pleasing prayer be built. A house built upon sand is labor in vain—sand is easy morality that can be shaken (1:225–226). From this citation it can be seen how attentive and reverently careful one must be with respect to the Jesus prayer. It should be prayed not just any way, but correctly. Otherwise, its practice will not only cease to be prayer, it can even destroy the one practicing it. In one of his letters, Saint Ignatius talks about how the soul should be disposed during prayer: “Today I read the saying of Saint Sisoes the Great which I have always especially liked; a saying which has always been according to my heart. A certain monk said to him, ‘I abide in ceaseless remembrance of God.’ Saint Sisoes replied to him, ‘That is not great; it will be great when you consider yourself worse than all creatures.’ The ceaseless remembrance of God is a great thing!” Saint Ignatius continues, “But this is a very dangerous height when the ladder that leads to it is not founded upon the sturdy rock of humility” (4:497). The definition of a Russian (slavonic) orthodox spiritual term «prelest» (прелесть). Being a very presice term for a widespread phenomenon in spiritual life, it can hardly be presicely rendered into English language by a separate word, thus needs a descriptive interpretation. Self-conceit and self-delusion that flatters and gives an illusion of smth spiritually great, beautiful and sweet. Being itself a result of a rigorous but false spiritual (religious) life, it (prelest) becomes an extremely stable ground for future spiritual wrecks and downfalls. The underlined words comprise the variety of possible translations (meanings) of the russian word (or its parts). The phenomenon of the this word comprising so different and contradictory meanings may be explained due to its acquisition by the fathers’ theology by the time its meaning was merging from extremely negative (in the past) to extremely positive (at present).